Formerly, we believed that Google Chrome extensions can be installed on all versions of Chrome, including the mobile version. We therefore claimed that ConstEdit is compatible with Android and other mobile devices operating systems. We made a big mistake here. Google Chrome extensions in fact cannot be installed on mobile devices. ConstEdit can be installed only if you have a desktop version of Google Chrome web browser. We apologize for any inconvenience caused by our incorrect information. All wordings in this website and in the ConstEdit User Guide have been corrected accordingly. A new version of ConstEdit, bundled with the corrected User Guide, is issued. You can download it for a trial at our page in the Chrome Web Store. ConstEdit has been rewritten as a Google Chrome web browser extension. You can now use ConstEdit on almost all operating systems, whether it be Windows, Linux or Android, with almost any devices, as long as you have Google Chrome web browser already installed on your device. Free Trial Period. ConstEdit is no longer freeware. You have a 31-days free trial period, during which you have full access to all functionality provided by the word processor. After that, you have to pay for a Full License in order to continue to perform the Save action. Please go to the Download page to see more details on the arrangement, and for the links to the ConstEdit page in Chrome Web Store. The old standalone freeware version of the software is still available for download from the Download page. ConstEdit extension is not dependent on Windows operating system and on the Microsoft .Net Framework. Editing of plain text files is no longer supported. Only html documents can be edited with ConstEdit extension. 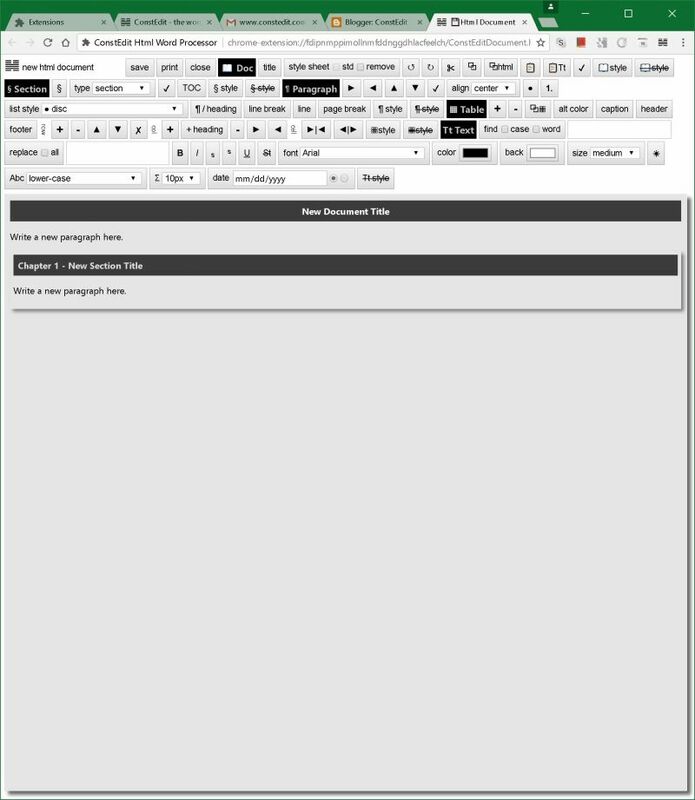 These html editing functions are no longer supported : word count, drag-and-drop-copy of section in Sections Structure Dialog, rectangular table cell selection, resizer to resize images/tables by dragging, relative links. File IO is more clumsy due to more security & privacy restrictions, as a result of working on a web-browser platform; you actually have even more data security and privacy protection than before. Please see the Limitations page for more details. New style properties are supported (column-count, vertical text, max-width), while some are taken away (background image style properties); the bundled stylesheets are newly designed. Technically the new ConstEdit has a much cleaner code base and much simpler design than before, which means hopefully less prone to programming errors. The new ConstEdit is more responsive in terms of performance. 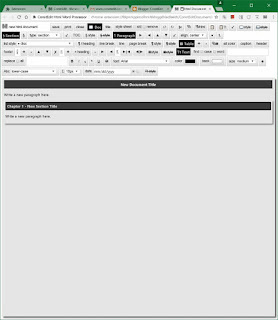 The rewriting of ConstEdit as a Google Chrome web browser extension is at its very final stage. Everything of the new editor is working well so far. Internally we are already using it for our own documentation. Hopefully, you will see ConstEdit appearing in the Chrome Web Store listing within one month's time. Thank you again for your very kind patience. We are more or less working in accordance with our initial schedule for the rewriting of ConstEdit as a Google Chrome extension. In other words, it would take about two more months for us to deliver the new ConstEdit. Here is a screenshot of the work in progress. In the mean time, please have a test drive with the standalone version of ConstEdit which can be downloaded from the Download page. Further to our decision to abandon the Firefox rendering engine of Mozilla Foundation, we have made up our mind to jump ship to the Google Chrome web browser. ConstEdit is now being re-written as a Chrome extension, rather than as a standalone program like it has been previously. The goal of the initial implementation would be to preserve as much functionality and convenience as possible, when compared with the original standalone version. You can expect documents produced by the current version of the editor be fully supported in the future version, as both are using exactly the same html5 format, which is standard across all modern web browsers. With the present progress, it may be expected that the extension be ready in about four months' time. For the time being, please have a test drive with the standalone version of ConstEdit which can be downloaded from the Download page above.